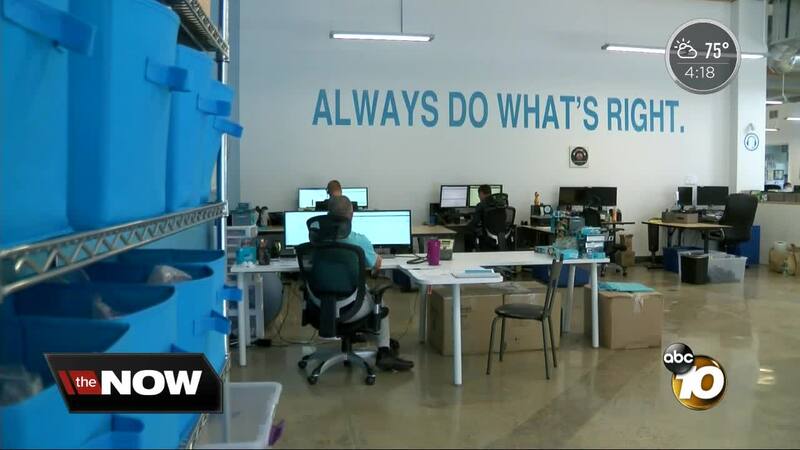 CARLSBAD (KGTV) - Among the businesses saying Trump's trade war is hurting is San Diego born JLab, a booming audio company competing with huge brands. The Silicon Valley-style company in Carlsbad is buzzing as you walk through the large modern rectangular door. "This company was four people four years ago, but now we're 40." CEO Win Cramer said they have lived the American Dream, saying they're a scrappy business always fighting to get on top. "We worked out of literally, a house, or a rundown office or an apartment building forever," he said. JLab competes against major brands like Bose and Beats . They found a niche and made a name for themselves, "We came out with some fun colorful designs that happened to be on trend." Cramer said innovation is their secret weapon. "It gives you the option to really tune out on a plane, you push a button and the engine noise goes away," explaining one of their earbuds . Their newest challenge is Trump's trade war. Billions of dollars in tariffs imposed on China are going into effect, and while all of the design work is done in Carlsbad, 100% of JLab's product is shipped from China. Cramer was sitting on a plane when he saw the alert, "this news pops up on my phone that $200 billion in tariffs announced, I quickly perused the list and saw our tariff code that we import 80% of our products was on the list and I just had this feeling of oh gosh we're going to have to fight this battle that we don't know how to fight." He is bending every ear within reach to spread awareness of how this affects JLab and other American businesses and even went to Washington DC to plead his case. Cramer said no legislators were there, just staffers and no electronic devices were allowed into the room. He said there is a written record of what was said. "It was the largest hearing in US history which in it of itself should tell you something and how folks are, at least businesses like us are taking this pretty serious," he said. Production costs could increase by 25% and with the holiday season upon us, he's running out of options, "layoffs or pay cuts being the last option, certainly not something that I want to do or think about or consider, but it's something we're being forced to consider." He hopes change is swift and those in power hear his plea. He said the company will find out in mid-September how big the changes will be, and will see impacts as early as October. Cramer added a lot of the burden will fall on the customer, as they will have to raise the products' price. JLab employs 30 people in San Diego.